In many ways it is an odd thing that squirrels are much of the world's favorite animal. Squirrels do not make good pets. They tend literally to bite the hands that feed and pet them. They can carry the fleas and mites that spread typhus and Lyme disease (you can read more about how they are transmitted at the National Library of Medicine & the CDC), and they band together to taunt, and sometimes injure, other family pets. More than one homeowner can tell stories of squirrels that became bold enough to run up their bodies and nip at their hands or ears. Squirrels are not vegetarians. In addition to biting the occasional human finger, they will also feed on bird's eggs, baby song birds, insects, insect-hunting lizards, and human food scraps ranging from leftover Buffalo chicken wings to cold pizza. Squirrels can do enormous damage to landscapes. Lacking the ability to distinguish red and green, they feed on green fruit and tomatoes as well as ripe fruit and tomatoes, often taking just a nibble to quench their thirst. They feed on flower bulbs and transplants and can devastate young trees. Squirrels can do enormous damage to homes and apartments. They can fall into transformers, cutting off power to entire city blocks. They can gnaw insulation off connections to electricity, television, and television cables. They can eat through siding to find indoor spaces for their nests, and ground squirrels can disturb sidewalks and pier and beam foundations of houses. This site does not advocate killing squirrels, although sometimes killing squirrels is permitted by law. You can find out more about the rules for where you live in the article "Does the Law Allow You to Kill Squirrels?" The reason killing a squirrel is not recommended by this site, however, is that killing squirrels does not work. Humane methods are not just more socially acceptable, they are also more effective. 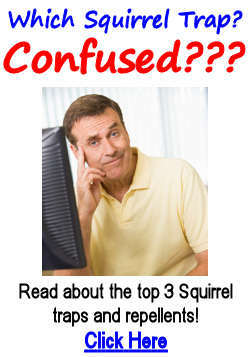 This site offers information on how to get rid of squirrels in your yard and how to get rid of squirrels in the attic. It provides pointers on how to get rid of squirrels naturally by understanding the important facts about squirrels and the different types of squirrels, especially the differences between red squirrels and gray squirrels. On this site, you can learn about how to get rid of squirrels naturally, choosing the best squirrel bait and choosing the best squirrel repellent. If it is a method for getting rid of squirrels that really works, you can read about it here. It's fun to watch squirrels in parks and in the woods. But if you would prefer not to watch them gnaw through the ceiling while you have guests over for dinner, use the methods described on these pages for getting rid of squirrels—without killing them—for good. Squirrels will cause a lot of damage when living in your attic. Remove them as soon as you discover them.